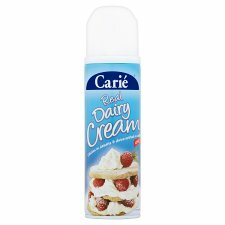 UHT sprayable sweetened dairy cream product with vanilla flavouring. This great tasting cream is perfect for all desserts and coffees. Top a luscious fruit salad, decorate a delicious tart, finish off a special coffee with a swirl or use on a fun banana split! Whatever the occasion, enjoy the taste of real cream. Pressurised container: May burst if heated. Keep away from heat, hot surfaces, sparks, open flames and other ignition sources. No smoking. Do not pierce or burn, even after use. Protect from sunlight. Do not expose to temperatures exceeding 50 °C/122 °F. Keep out of reach of children. 1. For best results, refrigerate for 3-4 hours before dispensing. 2. Shake well before each use. 3. When decorating, hold with the nozzle pointing down. 4. Tilt, clean and dry nozzle immediately after use. Once opened, keep refrigerated and consume within 7 days.